While Reggie is searching for Mike and battling a variety of alien or demonic beings, Mike is hunting down answers about The Tall Man, either by traveling into the past, an alternate timeline, or memories. It isn’t exactly clear, but also doesn’t really matter all that much. None of what you know from the past films is trustworthy in this one, with returning characters also suddenly turning into a sphere, in the first integration of digital effects in the franchise. Once again, Coscarelli makes certain to retain as much creative control as possible in the filmmaking process, taking credits for writing, producing, and directing. 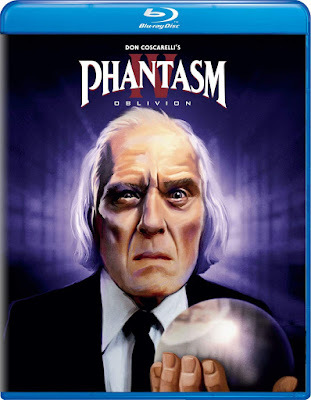 While it is impressive how much of the franchise has stayed in Coscarelli’s control, this is the film that it started to feel like a hindrance rather than an asset. The first film was a brilliant balance of real-world terror and the surreal, this sequel often just feels like rambling nonsense bonded by familiar characters and typical gore. The special features in the fourth film include yet another commentary track, this time with Coscarelli, Bannister, and Scrimm. There is also a behind-the-scenes featurette and a trailer.